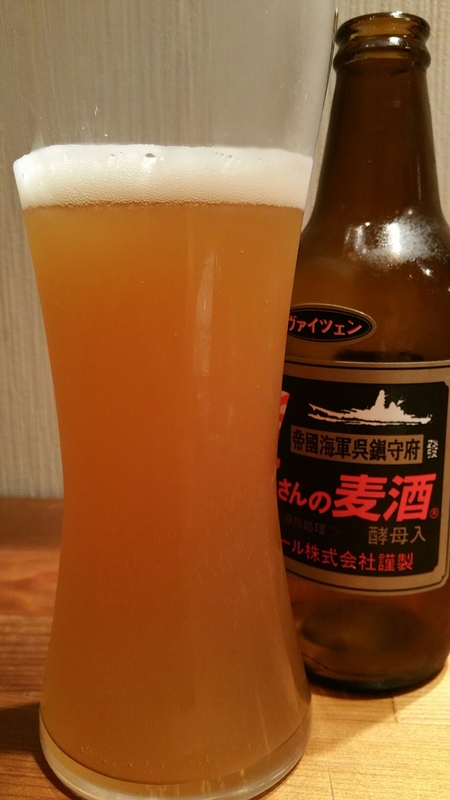 Kure Weizen is a 5% German hefeweizen from Kure Beer, based in Kure city, Hiroshima. It is part of their all-year round range of beers and can be found in both bottles and on draft across Japan. It won silver at the Japan Asia Beer Cup in 2013 and more importantly gold in the International Beer Awards back in 2011. Big banana and clove flavours. Kure Weizen poured out a deep cloudy golden brown colour with a surprising minimal amount of head – less than a finger’s worth in the special weizen glass. Heck, it was so flat that I wondered if somehow the gas had escaped out of the bottle but then I read about other people’s similar stories with this beer. It had a soft aroma of bananas and cloves along with a strong bready aroma to it that didn’t let up at all throughout drinking. It seemed like a prototypical weizen and was ticking all the boxes so far. The body was as close to a bold weizen as you could get. The wheaty flavours were paired up nicely with the bananas but the problem I had with this was the sweetness. It was just too strong for my liking and too cloying. It was possible to finish off one bottle but as the beer warmed up, the texture became sticky and less enticing to drink. If future iterations are toned down in the sweetness factor, then Kure Weizen would be much nicer to drink and would come highly recommended.